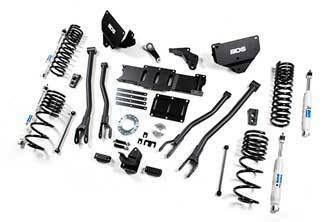 The newest addition to the 2500 Ram suspension line follows the same design as the 3500 Ram 4-Link conversion options. Like our popular 2005-2014 Ford Super Duty systems, we replace the factory radius arm setup for 4-link system. The design starts with 2 massive frame brackets that provide the mounting points for the new upper and lower control arms. These brackets locate off of the factory radius arm brackets, no factory bracket removal required. The new 4-Link brackets mount similar to the current radius arm relocation brackets, wrapping the frame and nesting in the factory radius arms mounts. As with our radius arm brackets, there is a minor amount of welding required to install the threaded frame insert (1 per side). This insert is necessary to provide the strongest possible mount. The new control arm positions at the frame create better suspension geometry and reduce caster change through wheel travel compared to the radius arm setup. This creates better handling and more controlled steering "feel", especially in rough terrain when the suspension is allowed to travel and articulate. The large diameter, heavy-wall tubular control arms are formed for tire clearance when turning and position the axle slightly forward from stock to create more clearance to the rear portion of the front fenders. In the rear the 2014-15 2500s have a rear multi-link, coil spring suspension similar in design to that of the 09-up Ram 1500s. For this new system, the rear lift is accomplished with massive new 4.5" progressive rate coil springs. These new springs provide an amazing ride and are designed to stand up to any load the new 3/4 ton trucks were built to handle. An axle mounted track bar relocation bracket repositions the rear track bar and centers the axle. Extended sway bar links keep the rear sway bar at the optimum operating angle. Replacement rear shocks round out the rear lift and provide that desired level stance. 3. Indexing ring only fits 6 bolt transfer cases (most common). Some heavy-duty tow package vehicle coul have 8-bolt transfer cases (w/heavy-duty Aisin 6 speed transmissions), order 122813.